Why Can’t My Dog Get Comfortable Lying Down? Dogs with joint pain or canine osteoarthritis often have discomfort that can worsen when they are lying down, or that can make the process of lying down difficult. If the amount of time your dog spends circling before lying down increases noticeably, or he attempts to lie down many times before settling into a spot, he may have joint pain. Older dogs are at risk of developing joint pain and arthritis, and large breed dogs and obese dogs are at greater risk of joint pain as they age than other dogs. If your dog is exhibiting pain symptoms or an aversion to lying down, take him to the veterinarian for a checkup to determine the cause, and to establish a treatment and pain management plan if needed. To prevent or delay the onset of joint problems, avoid stressing your dog’s joints and bones with excessive exercise when he is still young and growing. 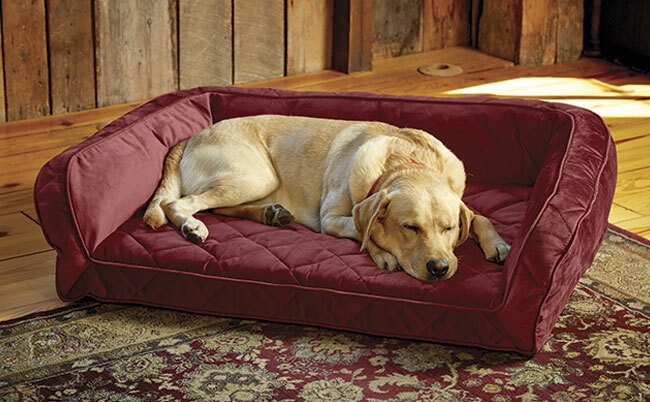 It also helps to make sure your dog always has a soft dog bed where he can lie down. Dog beds protect your dog’s joints and pressure points from hard floors, and separate your dog from the cold floor, which can worsen arthritis pain. If your dog is older, an orthopedic dog bed is his best option because it is specifically designed to support joints and to relieve pressure points. Dogs with anxiety disorders, such as separation anxiety or specific fears and phobias, have difficulty lying down to rest. If your dog is terrified of thunder, the issue is thankfully as short-lived as the storm. But if your dog has chronic anxiety or separation anxiety, he may be restless, pace frequently, and lie down on his dog bed and rise repeatedly when he should be getting rest. For dogs with anxiety, restlessness will coincide with other symptoms, including destructive behavior, such as dog bed chewing or scratching, panting not associated with heat or exercise, depression, nuisance barking, and compulsive behaviors. Talk with your veterinarian about your dog’s symptoms to clarify the type and severity of your dog’s anxiety. In cases of low-level anxiety, targeted behavioral training can help, while in more extreme cases a combination of prescription medication and training may be necessary. The health benefits of having a dog are well known, including lower blood pressure and anxiety. Simply being near your dog improves wellness. And the benefits go both ways. Though it’s important for a dog with separation anxiety to learn to spend time alone, take your dog for long walks and give him plenty of snuggles when you are home. Invite your dog up onto your bed or couch. And if you observe a ‘no dogs on the furniture’ rule in your home, consider an exception for your anxious friend: an attractive furniture protector not only safeguards your sofa, but can actually help the dog feel more comfortable and secure, enhancing the bond you share while reducing your dog’s stress and yours. Like people, older dogs experience some cognitive decline and, in some cases, dementia. One of the earliest symptoms of dementia in dogs is restlessness and shifting sleep cycles. If your dog has dementia, you may notice his sleep schedule changing and his periods of sleep shortening. He may even get up and down all night rather than sleeping peacefully when the house is quiet. If you’ve noticed sleep changes in your older dog, schedule a visit to the veterinarian. There are medications that can manage and even reduce some of these symptoms. It’s also valuable to establish a routine for your dog from mealtimes through bedtime. A daily schedule is comforting to dogs and helps them adjust to the disorienting problems of age more easily. Crate training your dog early in life also prevents problems with pacing and wandering the house at night that can arise with age. Gastric torsion, also often called bloat, is among the most serious explanations for a dog who is struggling to get comfortable. The clinical name for the condition is gastric dilatation-volvulus syndrome (GDV). When a dog gets bloat, his stomach dilates and twists, which can cause severe abdominal pain. One of the symptoms of bloat is an inability to get comfortable sitting or lying down. Though the causes of gastric torsion are not known, large and giant breed dogs with deep chests are at greater risk. Among the breeds at highest risk are Labrador Retrievers, Golden Retrievers, Irish Setters, St. Bernards, Gordon Setters, Newfoundlands, Weimaraners, German Shepherds, and Great Danes. To minimize the risk of bloat, feed your dog twice every day, rather than feeding him one large meal, and don’t let him play or exercise vigorously right after a meal. If the symptoms of bloat progress, your dog is in danger of collapse and possible death. Bloat is a medical emergency and doesn’t go away on its on its own—the condition requires surgery as soon as possible to correct. But it’s possible your dog can’t get comfortable lying down because of a minor issue like an upset stomach or a muscle strain from an exuberant game of fetch. In these instances, his discomfort should be minimal and short-lived. If he has ongoing discomfort or his pain is severe, he requires professional medical attention. With help from your veterinarian, and a soft place to lie down at home, your best friend should be curling up more comfortably in no time.